Have you ever noticed the amber (orange) turn signal bulbs in your headlights and side markers cause the majority of the lens to look orange? We've got a way to fix that! These chrome coated bulbs emit amber (or super white) light, but won't change the appearance of your turn signal housings. The difference in light output between the amber and super white is that amber is recommended for safety use and by most local laws. The super white has a white/bluish light that looks good but may not be legal for use in your area. These bulbs can be used for the turn signals in the 95-05 Neon (incl. SRT-4) and 07-12 Caliber (incl. SRT-4), as well as many other vehicles. Check your owners manual for vehicles not listed to see if you can use these 194 bulbs. Price listed is for a pair of bulbs. 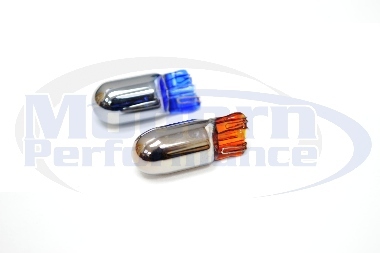 Is the amber coated turn signal bulb looks blue in the package? The silver coated bulbs all look the same when they are turned off - Silver! The only time you notice a difference is when the bulb flashes, it will be either orange, or super white depending on which one you choose. This won't cause a warning notification that a bulb is out it's just a direct replacement? Correct. Only LED bulbs seem to have a bulb out indicator, and flash fast because they do not pull as much power as a normal bulb. Because this is a normal filament style bulb, there is no flashing fast, and no error lights on your dash. These bulbs dont fit the turn signal connector for my NSRT-4. How do you install them? The Neon SRT-4 uses 3157 turn signals in the headlights, and 194 bulbs for the side turn signals. We primarily use these bulbs with silver or clear side turn signals.